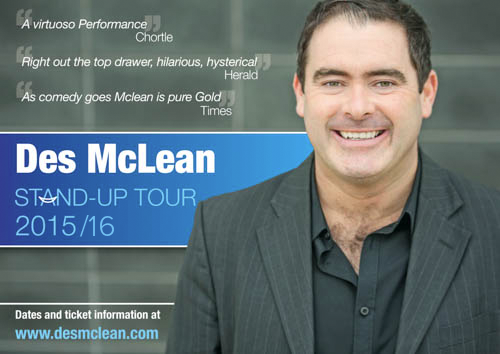 Des is currently on a nation-wide tour with his new stand-up show, with more dates being added; click here for latest dates and booking details. With more dates being added every month, it’s likely that Des will be playing at a venue near you, so check here for new dates. Be sure to follow Des on Facebook and Twitter by clicking the links at the bottom of this page. 2013 saw Des fulfil every comedian’s dream, playing Las Vegas at the iconic Riviera Hotel, where none other than the great Frank Sinatra played. 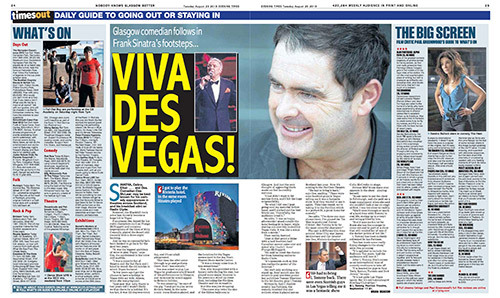 The Evening Times covered the appearance with this special double page spread.